Daris, Michael, Ashley and Koli. NBC Photo. 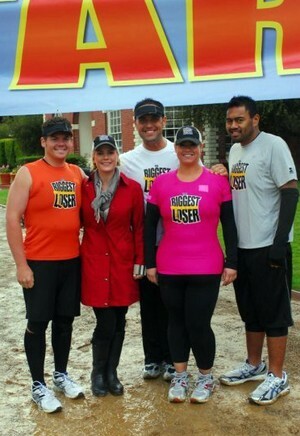 I watched with tears as the Daris, Koli, Michael, and Ashley from The Biggest Loser cross the finish line. Daris was an inspiration, despite the fact that his eating habits are still an issue for him, he finished 26.2 miles in just under a 4:03. I couldn’t believe it. This kid was incredible, and though he was verbally abused by Jillian Michaels for gaining weight during his training, I was impressed by his running form, he looked and acted like an athlete on last night’s show. Koli was the person who caused my tears. Just watching him want to finish was enough to send me into a blubbering mess. He finished so dramatically; and the personal strides he made with his father in the show showed me this was a guy who overcame some huge emotional hurdles with his family. Michael and Ashley also choked me up as they saw their siblings along the race. To see Ashley tear up when she saw her brother was emotional. All of them came so far literally and figuratively. This should tell you; if they can do it, so can we. I am very impressed by the dedication of these people. They trained for five months not only running but by building their core. Of course, they were on “The Ranch” for five months under the supervision of professional trainers, but these are all people who had something to overcome, and the fact that these people finished a hilly marathon was a great accomplishment. It got me thinking – in the fight against obesity, we can all carry out these goals. I’d like to hear your stories. Are your ready to run? « If Your Knees Hurt, You’re Either Running Too Much and/or You are Overweight. I hope you don’t mind that I linked to your post in my post about TBL Marathon. I appreciate the motivational aspect of the race, although I tend to worry that some of the contestants are push themselves to injury just to finish (and that at-home viewers may do the same). I am so happy you linked to my post. As I develop this blog with Training 101 tips hopefully my readers, and yours, and anyone intersted in how to train appropriately without injury will appreciate that the TBL runners (now officially marathoners) have been exercizing for five months with expert trainers. Most of us think we can do it alone and honestly I’ve recently coached someone who is overweight and has knee issues. He’s run a couple of marathons and from what I can tell, he is very motivated….almost too motivated. It’s not that people who are overweight are not going to have a stellar marathon experience, but like with pregnant runners, running with that extra weight will have a negative impact on one’s joints, ligaments, and bones. I did find these athletes an inspiration because of their drive. Finishing a marathon, like losing weight, is a mental battle. On that day, the TBLers won the running battle and good for them. I only hope that others who want to conquer a marathon consider training with a group and learn about the race, not just run it. A marathon is a long distance; not one to be taken lightly. Even professional athletes will take time off after a marathon to rest their bodies. Marathons are series races with serious consequences to the body. Good training will help tremendously.